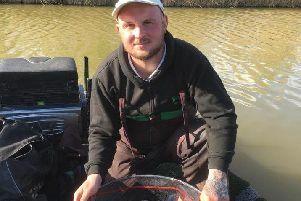 The big £1,000 qualifying open at Rookery Waters on Saturday saw a new venue at the fishery being used. Rook Lake is predominantly used for pleasure fishing due to the size of the carp and mixture of silver fish and was reflected in the weights and catches taken. Rob Humphreys caught a mixture of the two to win with 46lb 14oz and book his spot in the two-day final in August. Runner-up with 43lb 10oz was Tim Bates and third was John Price with 32lb 11oz. The Thursday £1,000 qualifying open on Jay Lake saw Jon Young take his second win in a row on the venue. He caught steadily all day close in with meat from peg 18 to finish with 141lb 2oz. Runner-up Keiron Payne used meat right over to finish agonisingly close on 139lb 5oz, and then came Mark Pollard with 135lb 6oz. Deeping St James AC put two teams in the annual East Midlands Angling Federation match held at Portland Waters near Newark. Deeping A came out winners with 11 points with Grantham second on 15 points. Both Deeping teams had section winners. They were Tony Johnson, Andy Wilson and Phil Price.